Today, Tuesday 7 November, Equal Education (EE), represented by the Equal Education Law Centre (EELC), enjoyed a momentous victory in the Pietermaritzburg High Court, in securing scholar transport for learners in 12 schools in Nquthu in Northern KZN. The KZN Department of Education and KZN Department of Transport have undertaken to provide scholar transport to these schools by 1 April 2018. Because of this, learners qualifying for scholar transport in the 12 Nquthu schools will have more time for teaching and learning in the classroom, for homework, and for rest. It means freedom from the burden of walking long, exhausting and dangerous routes to and from school every morning and afternoon. The alternative modes of transport that the two Departments will consider. Since 2014, EE and the EELC have been working to secure access to safe, government-subsidised scholar transport for schools in Nquthu. We have also demanded the issue receive national policy and budgetary attention. We have marched, picketed, and many times formally engaged provincial and national government both in writing and in person. EE has already secured hard-won victories; including the provision of government-subsidised buses to three schools in Nquthu in Northern KZN in 2015, the publication of the National Learner Transport Policy, and finally winning a public commitment from the national Basic Education Department to work with National Treasury to explore the introduction of a conditional grant to fund scholar transport. Today, we add to these victories the commitments secured in the Pietermaritzburg High Court. 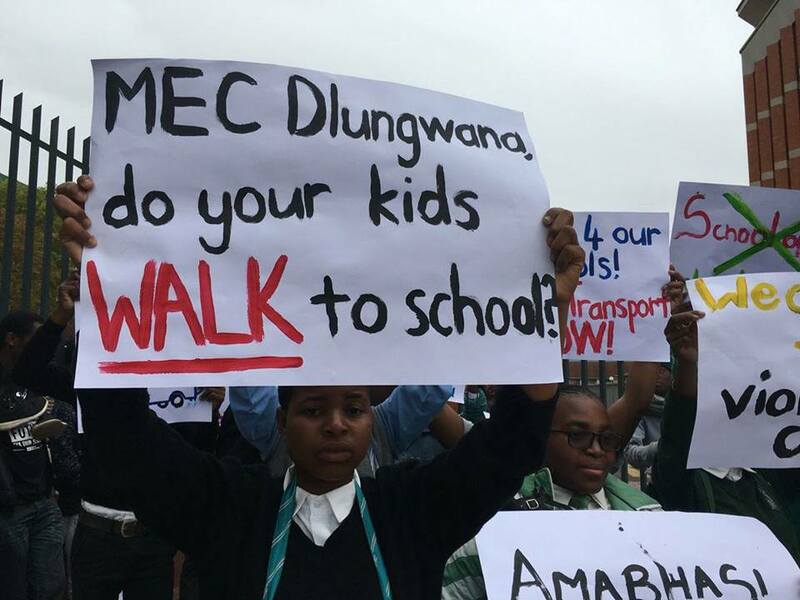 That it required three years of activism and a court challenge – while learners continued to walk hours between school and home, risking their safety to secure a basic element of the right to education – is something the KZN government must publicly account for. This is a reaffirmation of the power of learners, parents, teachers, and community members to force improvements to the basic education system of South Africa. Forward to quality and equal education for all! *We thank the attorneys of the EELC and Advocates Andrea Gabriel (SC) and Deborah Ainslie for their representation of us in this matter. Thanks also to Siphilisa Isizwe, represented by Section27, who prepared an amicus intervention in support of our case detailing the current policies inadequacies and lack of access to scholar transport for disabled learners.